FEATURE: Fighting Against the Old Order: What Is Holding Back the Rise of Female Headliners? What Is Holding Back the Rise of Female Headliners? its headliners, there is the sad inevitability that they will be dominated by men. Many have said that, because a few festivals have booked one woman/female act to headline, that is a sign of progress and understanding. Given the fact that the vast majority of festival headliners are men means there is no progress at all. There is this pledge to get festivals gender-equal by 2022 and, as I have stated in other pieces, that seems impossible. Maybe the festival bill is a bit more varied and equal but, even when you inspect all festivals’ posters, there are not many who are fifty-fifty. That seems insane because we are not even talking about headliners – how hard is it making sure that, below the headliners, you are gender-balanced?! It would not even be pandering and ticking boxes because of all the insane female talent around. I keep saying how the best music of the year is being made by women. Lucy Rose and Billie Eilish have just put out incredible albums and they sit alongside Julia Jacklin and Self Esteem when it comes to the titanic hits of 2019. Compare that to the men and I think there is a positive imbalance in favour of the women. A lot of the most promising acts around are either female or female-led. Whether it is an Indie/Post-Punk band or a great solo act, the variety and intention is definitely out there. “The organiser of Glastonbury Festival, Emily Eavis, has described the male-dominated booking culture at the event as "impenetrable". Eavis, daughter of festival founder Michael Eavis, said she faced an "old guard" of men in charge of booking artists for the festival. Speaking to BBC Radio 1 host Annie Mac, Eavis revealed how some colleagues had labelled her a "real hassle", but she remained determined to promote female artists, book female headliners and introduce more women into the team. "It's so annoying. But if you want to make progress you just have to do it, and you have to be up for being a bit of an annoyance. "That means me being really pushy with these people. It's the tiniest bit of progress. We are nowhere near where we need to be. "We're making slow progress but there's a long way to go". Although she wields a lot of power and can make some changes, it seems like she is facing a lot of ignorance. 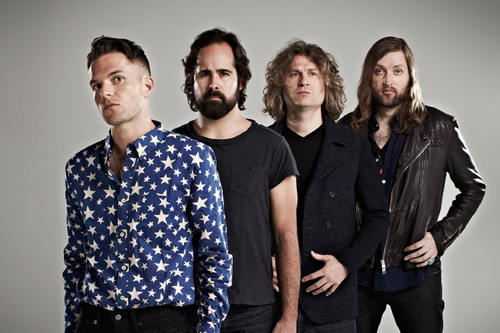 Glastonbury’s three headliners – Stormzy, The Killers and The Cure – are not the most exciting and I feel that The Killers could easily have been replaced by someone else. Consider the fact Janet Jackson cheekily promoted herself to a headline slot in a mocked-up Glastonbury images and that makes me wonder why she was not considered for headliner?! “Although Adele and Beyonce have both headlined the festival in recent years, this year's main acts are all male - Stormzy, The Killers and The Cure. Eavis said she wanted to put a woman at the top of the bill, "but the pool isn't big enough". "It's time to nurture female talent. Everyone wants it, everyone's hungry for women, but they're just not there." There is also a shortage of new male headliners coming through the ranks, she added. "It's that final jump. It's hard to make the leap to that level." More than 60 acts have been announced for this year's Glastonbury - with Kylie Minogue, Janet Jackson, Miley Cyrus, Billie Eilish and Lauryn Hill among the high-profiled female artists. The festival is expected to announce the rest of the bill shortly before it opens its gates in June. Eavis, who co-organises Glastonbury with her father, Michael, was speaking at an event staged by BBC Radio 1's Annie Mac in London. With husband Nick Dewey, Eavis is responsible for booking all of the festival's main stages”. With the likes of Lauryn Hill and Janet Jackson among the most exciting festival names this year, they both could have made for mouth-watering headliners. I wonder whether they were approached and whether it was felt they were not strong enough. Eavis has stated how there is not a deep enough pool when it comes to headline-worthy females; a lack of new artists who would make headliners and this dominance by men. Although Glastonbury has almost created a fifty-fifty gender split, I do think that one female headliner was in order. There is no shortage of talent in the poor when it comes to established acts. Beyoncé has headlined before and I keep name-checking St. Vincent. There is an exciting new breed of Pop artists who are ready to step up but the fact that big names like Janet Jackson and Kylie Minogue have been overlooked in favour of The Killers and Stormzy shows there is a problem with sexism and ignorance rather than quality. I argue that there is a lack of talent who can bring the crowds in because other festivals have booked women as headliners – why is Glastonbury not able to secure one?! It is the biggest festival in the country and anyone can rattle off a dozen classic artists who could do the job. Look at the best and most exciting albums of 2018 and 2019 and there are plenty of women making modern music so exciting. I know Emily Eavis is doing her best to secure female artists at the top but one feels like the calls are not going to the right people. How many women were approached to headline? You would not get a ‘no’ from all of them so it makes me wonder whether there was any consideration regarding equality when it came to the shortlist this year. Fleetwood Mac were mooted as headliners and, whilst the majority of the members are men, there are two female voices in the band – Christine McVie and Stevie Nicks. Events like the 6 Music Festival have booked names like Anna Calvi and Julia Jacklin on their bill. Maybe these artists are not quite big enough to headline Glastonbury yet but Emily Eavis intimated there were not enough new women coming through who could headline – bot the names I have just mentioned are very close to being headline-ready. Look at other festivals around the world and we can see big names like Solange (Primavera Sound) being booked to headline. She would have been great at Glastonbury and you could toss established names like Lady Gaga, Diana Ross or Annie Lennox. How about Björk?! All of those names are more exciting than The Killers so I do not feel like Glastonbury has any excuse when it comes to a lack of pull and talent. There are women, classic and new, who could beef out the bill and make it a lot more balanced. Any line of defense that asks to buy into the notion there are relatively few women ready to headline is ridiculous. I think, more likely, it is people like Emily Eavis getting less say and decision-making lure than the men. I suspected Glastonbury would disappoint regarding its headliners and gender but it is wrong to say there are few women ready to take to the Pyramid Stage and wow. I keep mentioning St. Vincent and others like Florence + The Machine and it is strange that they were overlooked. The fact is that I, and many others, have listed a whole host of great female artists who should be winning headline slots but are being ignored. I do hope Emily Eavis is able to permeate the ignorance around her and, at next year’s Glastonbury ensure that there is at least one female headliner – there is a vast list of names that discredit the idea that there is a lack of great female action in the pool of music. Eavis made a point regarding the men in music; the bosses and organisers who are responsible for bringing together the festival headliners. The notion of the middle-aged man playing golf and turning their noses up at women is, sadly, still evident. There are younger festival organisers emerging but most of the larger festivals still have the slightly older gent making the decisions. It is not just Glastonbury who are behind and have no excuses to hide behind. Look at all the festivals in the U.K. and none of them are doing enough. It is not only the fact they are booking men as headliners and completely overlooking all the ready and established women who can storm it. It is the boredom factor and the lack of excitement that gets to me. Whether it is Reading and Leeds or the Isle of Wight Fest, there is really not a lot to get excited about!